Home Sponsored articles Do you often ask Who’s Off? Do you often ask Who’s Off? When you are running any business, there are some tasks that are important but not really a great use of your or your staff’s time. Managing staff leave and holidays is probably one of them, yet you are obliged to keep accurate records of all such leave. The person managing the staff leave, can be anyone from the business owner, a highly paid manager, PA, busy accounts staff or senior HR personnel, with many spending valuable time every single day – just discussing staffs needs, queries or requirements, that’s even before they get down to actually recording or managing the data to keep these important records up to date. Knowing who’s off today, whos’s off tomorrow, next week or how the summer period is looking, is all relevant to planning and running any successful business. But looking after staff leave can become a very time wasting ‘spreadsheet hell’ or ‘wall planner pain’ – the answer is probably online and can be brought under control with the use of an easy to use online staff leave planner. With a web based leave planner, such as WhosOff.com, you can easily see who’s off! Your staff can make leave requests online or via a mobile app and the appropriate manager or approver can be notified straight away. If they’re connected, they can then authorise leave requests, quickly and efficiently, in minutes. Managers or department heads can make these approval decisions or even choose to decline requests, based on immediate up to date live calendars delivered online, which gives them all the information they need in an easy to follow calendar with additional supporting leave allowance information for the individual staff member requesting the leave. These sophisticated online services offer easy access at prices that makes sense to almost any business and will not break the bank, with built in discounts for companies with larger numbers of staff these online services offer broad appeal for managing not just holiday leave but also other Out-of-Office times, meetings, medical appointments, sickness etc. Tracking holiday and sick leave is a must for any business and can now be dealt with securely online without wasting managers or staffs time. The business benefits are not just in the time saved in the administration. Whilst this is an important consideration when implementing any leave system, and perhaps the easiest comparison to “value” the benefit. It has been estimated, for example, that on average the time spent by all parties involved in dealing with a holiday request, checking and approving etc. can be 1.5 hours! Especially when you consider the administrator needs to check if there are enough days available, does the holiday clash? is there enough people in the department? does the leave need approving by a manager? Etc. There are some other real tangible benefits beyond the administration side. Having your leave and absence in a more transparent system can help your staff to make better informed and more timely judgements when seeking leave, avoiding the end of year rush, or at least making it easier for you to see that people need to get their holidays in so you can respond accordingly. You can see trends, of sickness for example, but not only you but your staff can too, this can becomes obvious to all.. even the “repeat offenders”, you can plan meetings and other events without having to ask or refer to the Wall planner as to who is going to be available. For businesses with offices in different locations, you can see who’s off – you don’t need to ring just to be told they are away on holiday –everything becomes a lot more manageable and easier. Even the staff appreciate that getting leave authorised is no longer a frustrating paper trail of approvals and checks or lost paper applications, they in turn become more reasoned about their holiday leave requests. They can log-on wherever, whenever and submit a request or check who’s off. Some services also offer calendar feeds so leave dates can be seen directly in MS Outlook or Google calendar, again a great feature to easily see who’s off. For those companies with larger numbers there are upload spreadsheets to kick start the take up of such services. 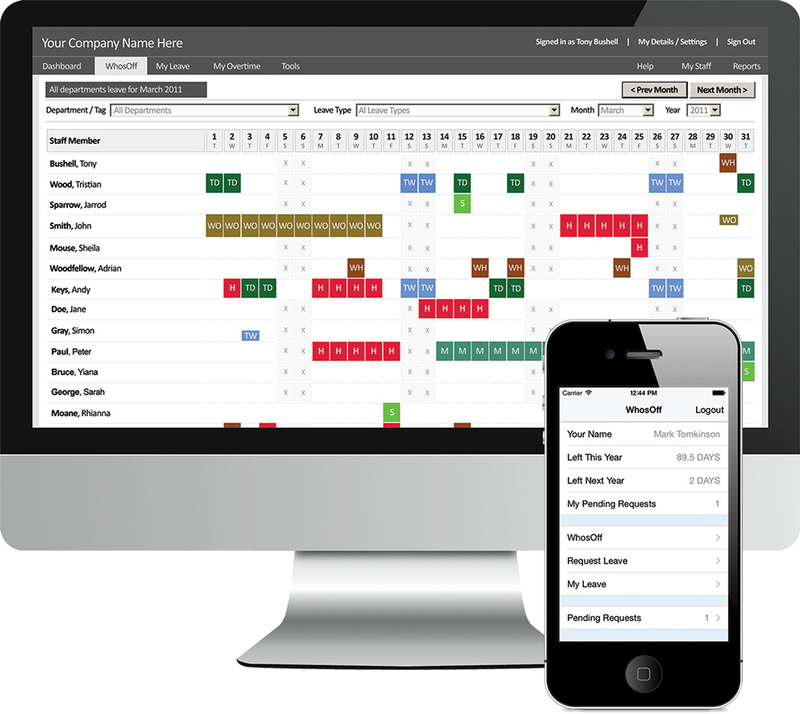 Most will have reporting and export tools – along with other handy features for administrators to check and review all leave and out-of-office times giving detailed information on the past as well as the future. Some services will cater for part-time workers, or workers with leave logged in hours instead of days or half days, or the logging of over-time – but a quick overview of their features or a free trial will usually let you know if a particular service is going to work for you. Most reputable companies offering this type of service will give you at least a month free trial – or more, be clear and transparent about their pricing, have no hidden extras, and there should be no long term commitments with an easy ‘get out’, moreover all such services should publish their address and contact/support phone numbers. WhosOff.com offers such a service and is a leading online Staff leave planner – helping SME’s across the UK (and the World) manage staff leave and holiday via the web and mobile Apps. With nearly 90,000 active users using the service from smaller business with less than 10 employees to ‘blue chips’ with over 1000 staff members. WhosOff is IS027001:2013 certified for Information Security. WhosOff.com We’re passionate about leave and delivering a great service.